Today I celebrated the Hindu festival of Holi under clouds of technicolored powder along with millions of people in Nepal, India, and around the world. This annual raucous Festival of Colours is a celebration of the vibrancy of spring, fertility, love and the triumph of good over evil. I flew in from Toronto the previous day especially for the festival and the opportunity to celebrate a festival that had long been on my adventure travel bucket list! 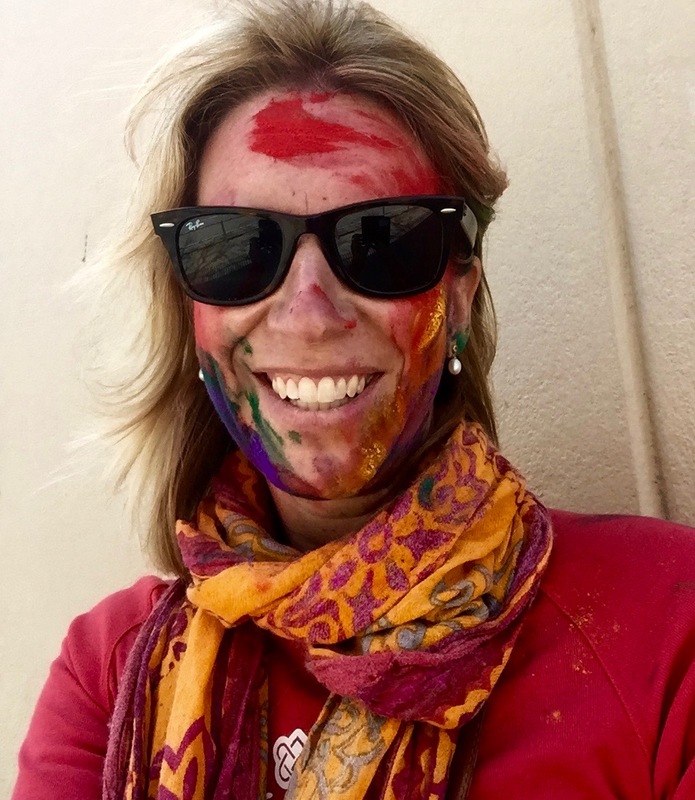 With a fresh round of jetlag, I sat down with a steaming pot of coffee and mountain of french toast at The Terrace (my home away from home) to develop a holi (or rather holy!) plan of attack. 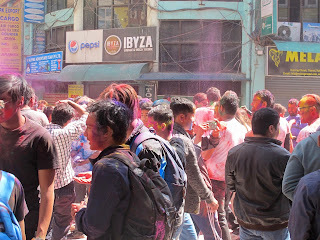 My objective - to participate in the infamous technicolour Holi celebrations which would imminently unfold between the cars, motorcyles, pedestrians and cows of Kathmandu’s chaotic and dusty streets. I’d mentioned to Raaz, my host at The Terrace, that I’d planned to venture out to “experience” the festival and he chuckled to himself – no doubt anticipating the state of my return and already preparing for the laundry request. To celebrate Holi, festival revelers of all ages dress in white clothing and come together to celebrate by smearing bright colours on the faces of family and friends and by throwing water-filled balloons and dye-filled squirt guns while greeting each other with wishes of ‘Happy Holi’. 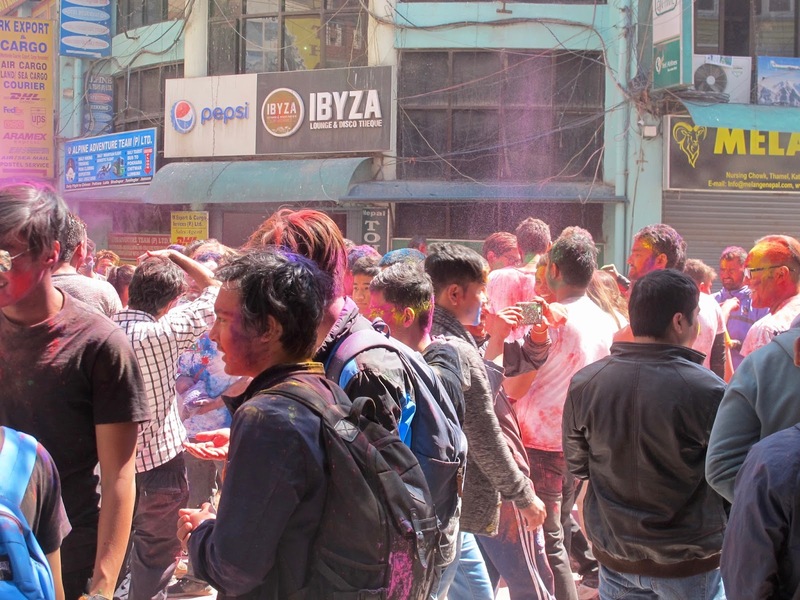 I’d heard that in Thamel – the ‘backpacker area’ of Kathmandu – the festival can get quite raucous. The festival dates vary from year to year so if you plan on booking your trip to Nepal (or India!) 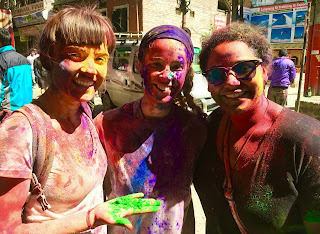 around Holi festival dates, it’s best to check them in advance. I set out on my adventure at around 10am, hoping to get a ‘taste’ of the action without having to engage in full fledged battle with hyperactive Nepali children and overzealous Western tourists. Logically, throwing brightly coloured dye and squirting water out of guns at unsuspecting tourists does involve consumption of copious amounts of alcohol so the earlier start was also strategically planned around getting a more “controlled” experience (damage control!). 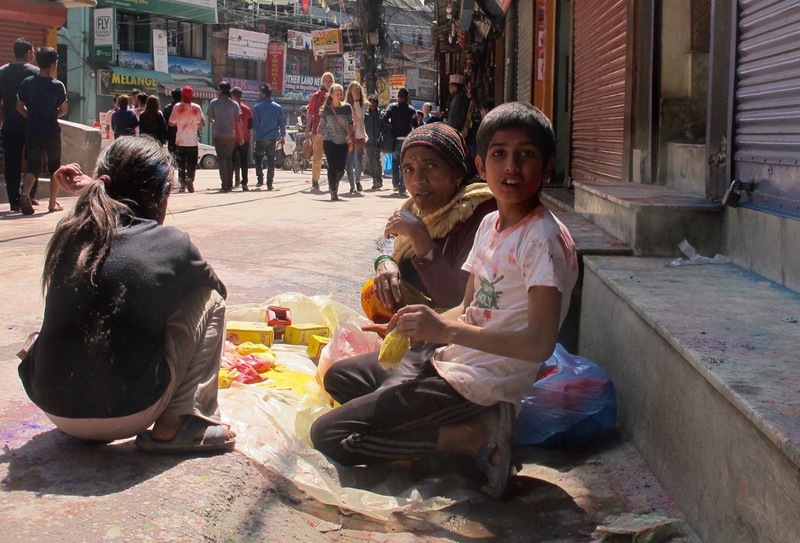 I decided to participate in Thamel because it was within walking distance of my guest house in Durbar Marg and an area that I know well (with strategic hiding places which I’d scoped out to duck for cover). 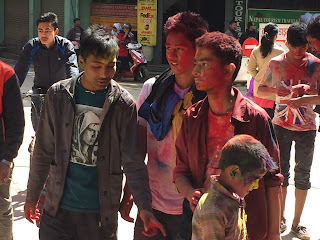 There are however areas all around Kathmandu where holi is celebrated. There are private, family gatherings focused on family, food and fun as well as more public festivities which can attract thousands of revelers e.g., Durbar Square. As I set out into the street, I realized that my fashion faux pas was that I didn’t wear white… (which may also have been my saving grace – future tourists take note!). On hindsight, this turned me from ‘target’ to ‘tourist’ and gave me some initial ‘cover’ and time to fully assess the celebrations from a distance. And the celebrations didn’t disappoint – it was, in two words, ABSOLUTELY BRILLIANT and so much fun. For many reasons I wish that I would have come better prepared. Having experienced Kathmandu in many different ways and guises over the past 17 years, it was wonderful to see the streets so alive with colour and filled with laughter. 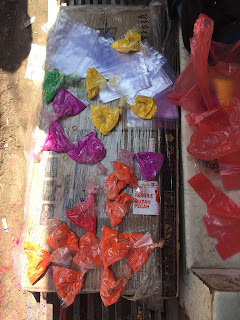 Men, women and children of all ages gathered in the main thoroughfares of Thamel and smeared canary yellow and blood-red dye on each others faces laughing and screaming ‘Happy Holi’ while water-balloons pelted down from the arms of laughing children sat in the open windows of the buildings above. At one point, a pick-up truck flew through the dusty square, open backed and crammed with people chucking water balloons and pointing dye-filled water pistols at revelers on the street. Rammed strategically into the back of the pickup truck sat a smug looking man caked in blue dye holding a giant (and especially expensive looking) video camera completely covered in plastic. This clearly wasn’t his first rodeo. Despite some weak attempts to stay as ‘dye free’ as possible I did end up getting suitably and appropriately inked that morning. The giant smiles on the faces of the children who approached me open-handed with red dye were 100% worth the industrial sized box of wet-wipes it took to wash the colour off..! Whilst my experience was very much on the periphery of the festival, I’d certainly recommend it to others thinking of including it in future Nepal / India adventures. Do your research before you go and come prepared… It will certainly be a day that you’ll not soon forget! Finally, what struck me today in the streets of Kathmandu were the smiles and the fun. With that in mind, on this day of Holi, I'd like to wish you and your families more smiles, less worries; more compassion, less judgment; more blessings, more love and more prosperity today and in the year ahead…!